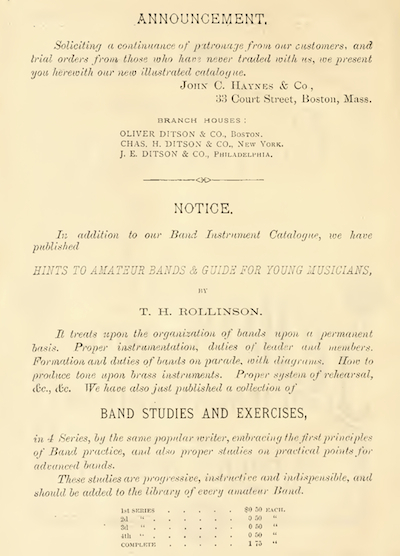 One would think that a company which vanished more than 100 years ago would be difficult to research, but there is actually quite a lot of information to be found on John C. Haynes & Company, the musical instrument manufacturing branch of the Oliver Ditson Company. It is a testament to the Haynes Company's size and influence that such a great deal of ephemera and other advertising was left behind. 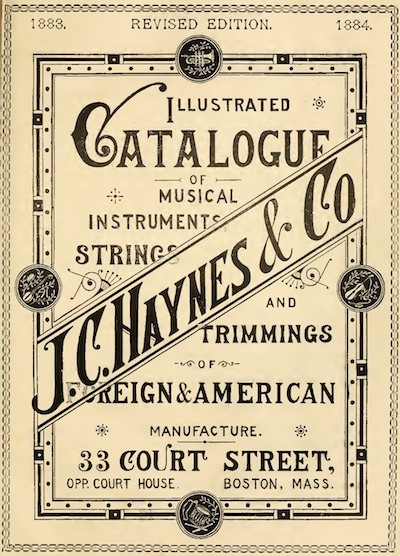 An original 1883 John C. Haynes & Co. catalog is held in the Winterthur Museum Library in Wilmington, Delaware. 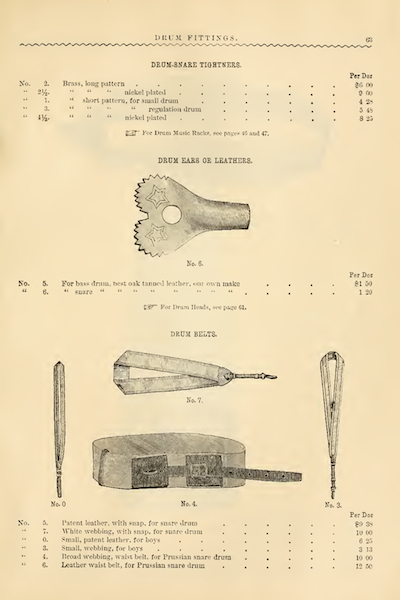 And thanks to modern technology, and sponsorship from the Lyrasis Members and Sloan Foundation, the full catalog has been digitized and is viewable online at the Internet Archive. 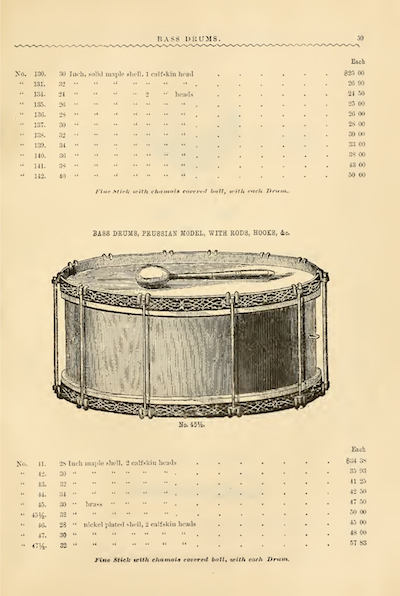 Listed in the catalog amongst a myriad of other instruments ranging from accordions, banjos, and bassoons, to violas, xylophones, and zithers, are of course drums. 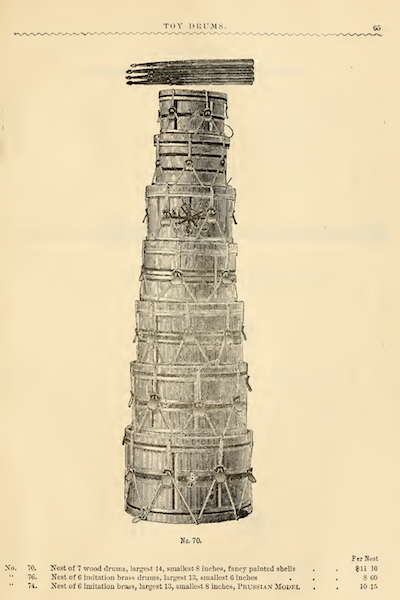 Included are a couple of different styles of drums notably rope tensioned wooden shell drums available in rosewood or maple, and 'Prussian' style rod tension drums which were offered with maple, rosewood, nickel, or brass shells. Both rope tension and rod tension 'Prussian' style bass drums are catalogued as well. 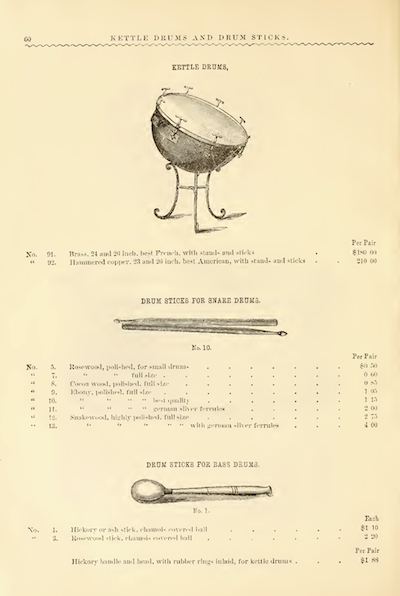 Timpani are listed in two styes: "French" which utilized brass shells, and "best American" which employed hammered copper shells. Eight models of polished snare drum sticks are offered in a variety of woods including ebony, rosewood, cocoa wood, and snakewood. 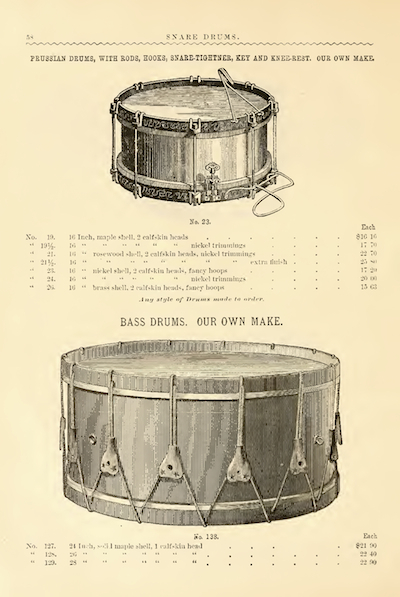 The catalog lists a full selection of calfskin and sheepskin drum heads, and a variety of drum snares including natural gut and "clock cord" which was likely made from braided linen. A full selection of drum fittings for both rope drums and rod tension 'Prussian' style drums is also offered. The last drums pictured are "Toy Drums" which were smaller sized, more simply built drums for children and young drummers. 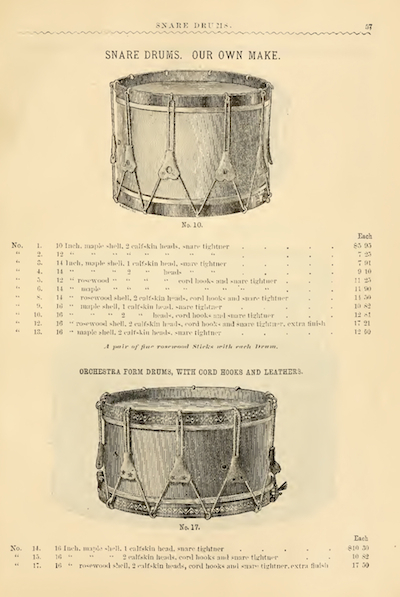 Do you have a drum made by John C. Haynes & Company? I'd love to hear from you! Feel free to send Lee an email at lee@vinson.net.